The Iranian blogger, journalist and ex-intelligence agent residing in Germany, Amir Farshad Ebrahimi, has been arrested in Turkey due to a request by Iran, according to informations of the German R-Archiv.de. The accusations are so far unknown. Amir Farshad Ebrahimi lives in Germany and has a German (foreigner-) passport with the number N0014860. Free Kareem and the Committee to Protect Bloggers have announced a joint mail campaign in support of arrested Egyptian blogger Kareem Amer. Please also have a look at Alexandra Sandels’ article about this campaign at Menassat, which includes statements by both Free Kareem Founder Esra’a Al-Shafei and Egyptian blogger Wa7damasrya as well as some background information. The campaign has also been covered by Marshall Kirkpatrick of ReadWriteWeb. If you need more information about the “Flood the Jail with Mail” campaign, please feel free to contact the team of Free Kareem. Fouad Mourtada, the 26-year old IT engineer who has been arrested on February 5th, 2008 and sentenced to three years in prison and a fine of $1350 for creating a fake Facebook profile of King Mohammed VI’s younger brother, Prince Moulay Rachid, has been released about an hour ago. According to a source close to Help Fouad campaign, Fouad got a full royal pardon and left the Oukacha Prison (Casablanca) at approximately 1:00pm and is on his way home. Osama Edward Mousa is an Assyrian (Syrian Christian) journalist, blogger and human rights activist. According to Mideast Youth ((Mideast Youth » Assyrian blogger arrested in Syria)), Mousa was arrested by Syrian authorities on February 27. Since then, he has not been heard of, but seems to be held in a Damascus prison. It is feared that he witnesses torture. Although no reason was given for the detention, it seems as if Mousa was a victim of his online writing. Apparently he was arrested directly due to content on his blog, where he criticized the Syrian government and its economic policies. Mousa is the second blogger currently imprisoned in Syria. He joins long-term arrested Tariq Baiasi ((Blogger for Freedom » Arrested Bloggers: Tariq Baiasi)), who has been held in custody since July last year. Prior to them, at least three further Syrians had been detained by security forces, as our list of arrested bloggers shows ((Blogger for Freedom » Arrested Bloggers)). Syria is notorious for its human rights abuse and a significant lack of press freedom. When the Reporters without Borders’ annual report on press freedom ((Reporters without Borders » Annual Report)) was released last month, it noted that “the filtering of online traffic significantly increased”, threatening bloggers such as Tariq Baiasi. He was subsequently arrested due to an anonymous comment left on his blog. 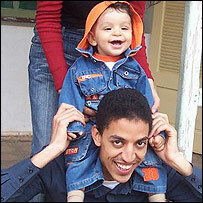 In the case of Osama Edward Mousa, it is not a rarely known blogger, but a political journalist who is imprisoned. Other than Baiasi, Mousa seems to have been become the victim of his own writings. There are close to no informations about his arrest; however it shows that the Syrian government and police do not care much for human rights and will continue threatening press freedom even in 2008. Update: Esra’a of Mideast Youth has informed us that Mousa was released from prison on March 8 ((Mideast Youth » Assyrian blogger arrested in Syria)), but did not give any further informations about the backgrounds of the detention. On February 22, it’s the first anniversary of the jail sentence against Egyptian Kareem Amer ((Blogger for Freedom » Arrested bloggers: Kareem Amer)). Arrested since November 6, 2006 the blogger was sentenced to four years in prison for defaming Allah and President Mubarak. He shall not be forgotten: It’s time for new rallies. Since his detention, Kareem has suffered in prison. He has been threatened, even tortured ((Free Kareem! » Kareem is being tortured in prison)) – and still says that “prison didn’t change him” ((Free Kareem! » Prison didn’t change me: Kareem Amer)). The “Free Kareem” campaign ((Free Kareem!)) is for sure the most famous of numerous groups supporting arrested bloggers. Dozens of rallies have been held worldwide, attracting a high media attention on the young Egyptian’s case. To keep up the good work, they call for an “op-ed day” on February 22 as well as for another three rallies in support of Kareem. “Op-ed” stands for opinion / editorial – and that’s the part of a paper we’re as many as possible articles on Kareem shall be published on February 22. The Free Kareem! group, lead by Esra’a Al-Shafei of Mideast Youth ((Mideast Youth – Thinking Ahead)), is trying to convince journalists and authors from all over the world of writing an article on Kareem Amer. But also bloggers are called for participation – every supportive word is needed. But words are just one part of the protest: There will also be rallies in three different cities. In Washington D. C., London and Paris supporters of Kareem Amer will hold demonstrations for the freedom of the young Egyptian and, through that, the freedom of expression in Egypt and all over the world. They wont be the first and they hopefully wont be the last demonstrations for Kareem, continuing a long row of rallies in more than a dozen cities of the world. No matter where, you can publish an article on Kareem’s case. If it’s your blog, a student paper or an internationally published magazine – every single word counts. You may also attend one of the three rallies held for Kareem Amer in Washington D.C., London and Paris. Tariq Baiasi ((Blogger for Freedom » Arrested bloggers: Tariq Baiasi)), a Syrian blogger, has been in prison for more than half a year now. He has not been taken to court, no trial was held against him. Far too long, some of his fellow bloggers think – and have started the Free Tariq Campaign ((Free Tariq)) to help him. Tariq had to wait a long time till his case even got attention. It’s been more than seven months now that the young computer seller, a quiet 23 years old from the city of Banyas, was kidnapped by the Syrian police. His father had spent 20 years behind bars because security agents who mistook him for a Muslim Brotherhood member – Tariq was arrested for a simple comment on the internet. A comment left on a public forum, criticizing the Syrian security forces, caused the bloggers detention on July 7 last year. And since then, nobody has heard of him. But unlike other arrests of bloggers – i.e. Kareem Amer ((Free Kareem)) or Fouad Al-Farhan ((Free Fouad)) – his detention did not cause an international outcry. Tariq did not have the luck to have highly committed friends, he was no leading blogger. And silence came over his case. It lasted for months, till a single Syrian blogger started to post articles on Tariq again ((Global Voices Advocacy » Syrian bloggers campaign to free fellow blogger Tariq Biasi)). And soon, only a month later, five bloggers founded the group “Free Tariq” ((Free Tariq)). Freedom is nothing one can get over night. It’s a process – and human rights campaigns, especially if they focus on freedom of speech, are part of this process. Groups like Free Tariq may not free the blogger they focus on, but after all they attract attention on the importance of freedom of speech and create a public consciousness for human rights. As long as people don’t even know about their freedoms, they cannot demand for them. Activists such as the initiators of Free Tariq create the possibility for people to get informed about human rights, enable them to fight for their own freedom and the freedom of others.